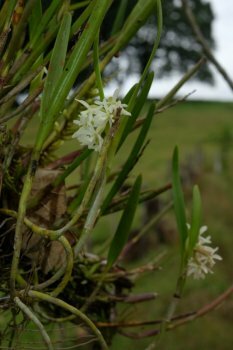 Discussion in 'Orchid Species' started by DanaRaluca, Feb 11, 2019. 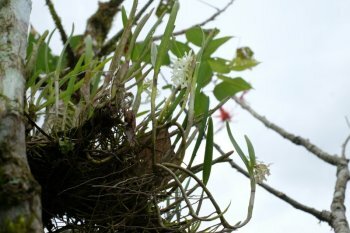 I have seen this orchid at low altitude (around 450m high ?) in Costa Rica. The flowers are small and moderately fragrant. Can anyone, please, help me to ID it? I was thinking of epidendrum, too, but I couldn't find anything that matches this orchid. The epidendrums I know, have all longer canes, like dendrobium. But this one has clear pseudubulbs with 2 leaves each. It looks similar to Epidendrum zosterifolium, but that species comes from Ecuador, and it's flowers are smaller. I'm fairly certain the orchid in your photos is an Epidendrum, but don't know what species. I am not familiar with any of these species, but in the photos I have found on the internet, both have cane-like stems, with more leaves.